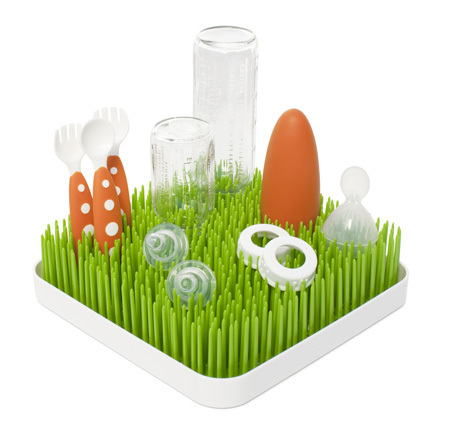 Boon, Inc. is a company that makes great, affordable, BPA, phthalate and PVC free products for babies and kids, and donates 10% of their profits to charity. If the name sounds familiar, you may have seen the Boon Frog Pod. We’ve been using ours for over a year now and we still love it. 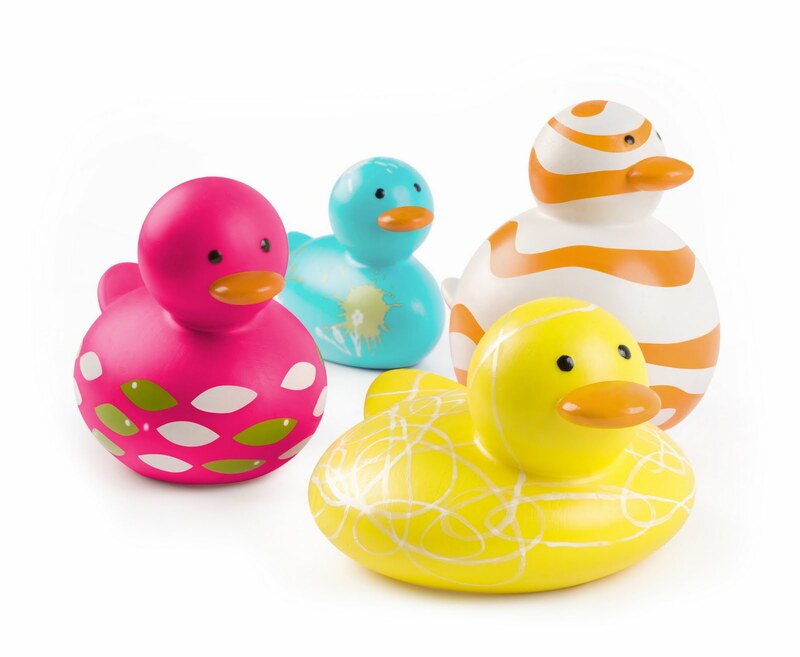 They have “odd ducks” (hee hee) and other bath items that are completely PVC, BPA and phthalate-free. Another product I’ve seen in stores and loved is their countertop drying rack. So unique and fun, but still no PVC, BPA or phthalates. They have snack containers, utensils, plates, bowls and sippies that are also sans the nasty stuff. I have to point out their animal bags. We have weeded my daughter’s stuffed animals dozens of times, but they keep breeding. I keep threatening to let hunters in here to thin down the herd, LOL. This is just the most awesome idea. Ingenious! The last thing I want to show you before I actually get to the review is the Flair High Chair. It has a sleek, modern design, pneumatic lift (really!) and a seamless seat. As you may have already guessed, yep, no BPA, PVC or phthalates. OK, so Boon sent me the Flo water deflector and protective faucet cover with bubble bath dispenser. 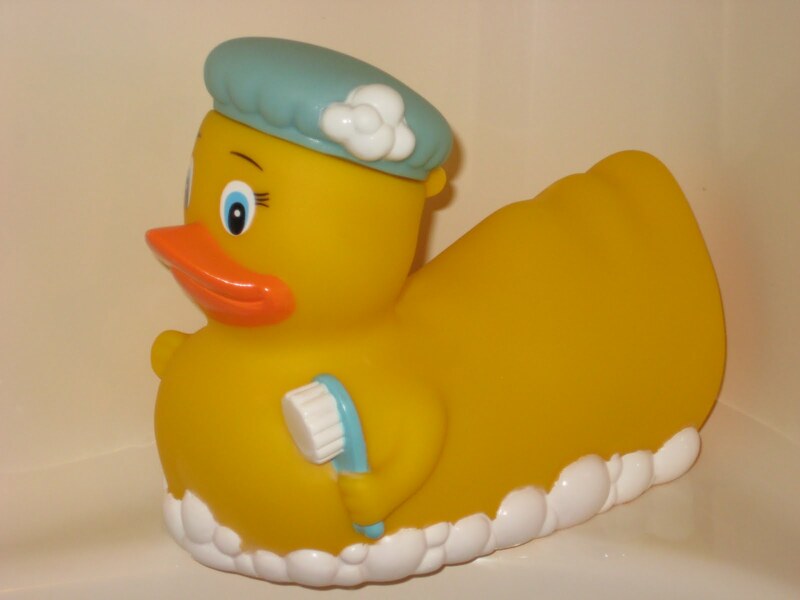 In our old house, we had the little guy pictured below covering the spout in my daughter’s tub. It won’t fit on the faucet in this house. I didn’t worry about it too much since my daughter is 5 and my son is still using the baby tub, but he will be taking baths in the “big tub” soon enough, and I need a cover! The Boon Flo is way better because not only does it have soft materials to cushion from bumps, it actually creates a waterfall to help you rinse hair! We use a cup to rinse hair now. It also has a spot for the shower diverter, so you don’t have to take the cover off in order to use it. It has a spring activated grip that makes it easy to install and remove. I was really excited to install it and let my daughter test out the bubble bath dispenser. Augh!! It doesn’t fit! I guess this weird freakin’ 90 degree angle faucet has doomed me. On a side rant, I am still peeved that I even bought this faucet. I loathe the stupid thing. Not only do covers not fit on it, but as you can see, it looks perpetually filthy with water spots. 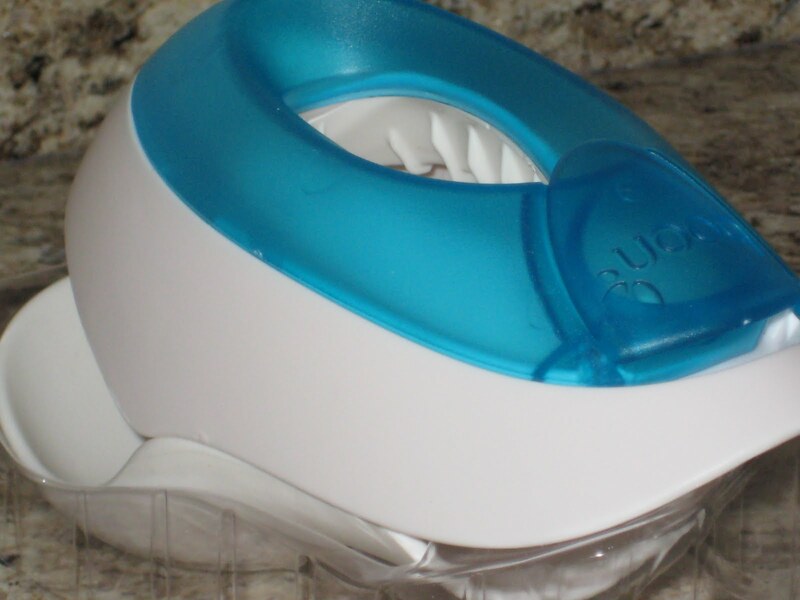 Who wants to clean their faucet with appliance cleaner? Not me! Guess who did just that right after taking the picture. Yep, me! I put it on the best I could, and it works well enough for what I want it to do (protect little noggins.) 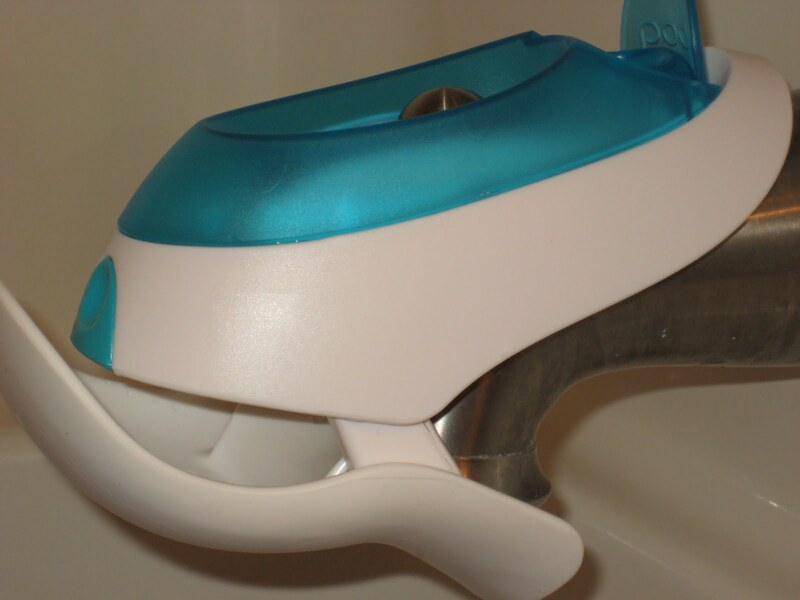 It’s such an awesome product with the “waterfall” feature, the ability to put the bubble bath in and let your kids push the button to dispense it, along with the easy access to the shower diverter, sleek looks and easy installation. I love Boon’s affordable, safe and quality products and I love their commitment to giving back. Check out Boon’s Blog, Boon’s Facebook Page and follow Boon on Twitter to keep up on all the latest. Thank you Boon for sending me the Flo at no charge. The complimentary product in no way affected my review! All opinions are always my own. >We just bought the Flo a few weeks ago and we love it. It fits really well over our faucet (bummer that it doesn't fit yours!) and our 15 month old loves to rinse his hair under the waterfall. It made bath time so much more fun for him! I think it's a must-have!!! >Thanks for the review. I went out and purchased this item and I absolutely love it! My son has always loved to sit in the tub under the running water and with the waterfall it brings him out of the front corner of the tub (so mom can sneak in and wash him :D) and it is great! I have not tried putting the bubble bath solution into the faucet but will have to do it! Thanks for the review! >thanks for the review! i'm planning to get this, and the review confirmed that the product is worth getting.